There seems to be type of place in Munich which is quite a new concept for me. It's a hybrid between a breakfast-, lunch place and a bar. You can basically go here at any point in the day and your needs of that specific time of the day will be satisfied, whether you're craving some pancakes or you're in need of a strong Gin & Tonic. Munich seems to have loads of these hybrid places (this one for example), which makes it hard to decide at what time of day to try them! Hoover & Floyd is another one of these. 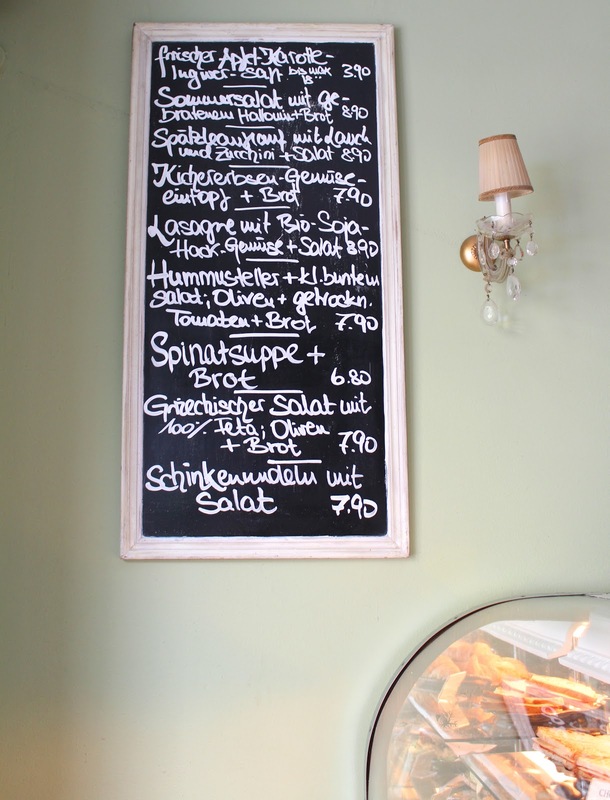 Last Sunday, I was craving a sweet brekkie so we headed to this cute brunch hotspot in the Glockenbachviertel for a seriously tasty morning. 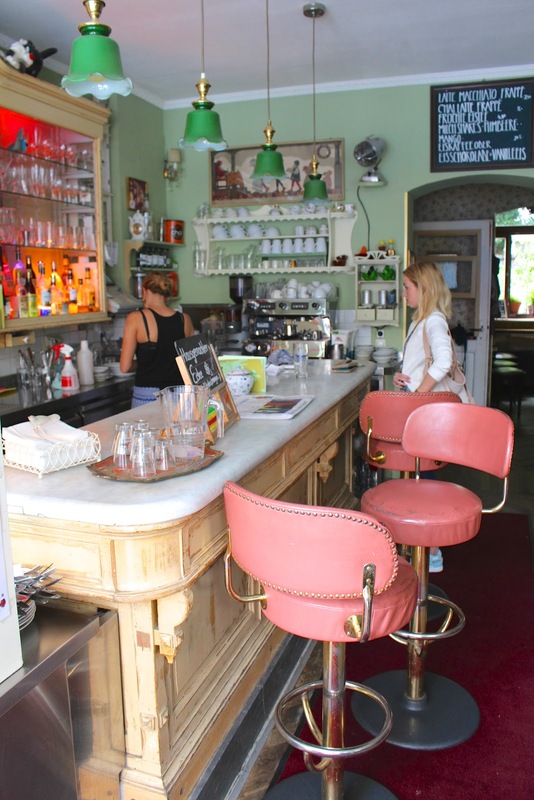 Hoover & Floyd has a cute twenties-style interior with high pink bar chairs and relaxed sofas. There's a nice bar for night-time drinks but we on Sunday morning we opted for a seat outside, under the umbrellas. When flipping through the menu you might think you've come to the wrong place for breakfast. However after skimming through pages and pages of drinks, you finally come to the breakfast menu on one of the very last pages. Almost everything is bio though we decided for one of the least healthy options: the Wonneproppen, which - as I understood - is just French toast. People next to us were having the muesli with fruit, paninis, halloumi salad... everything looked delicious! With the breakfast items you also get a small glass of fresh orange juice, which for me adds a million breakfast points! I also had a carrot-apple-ginger juice with it. 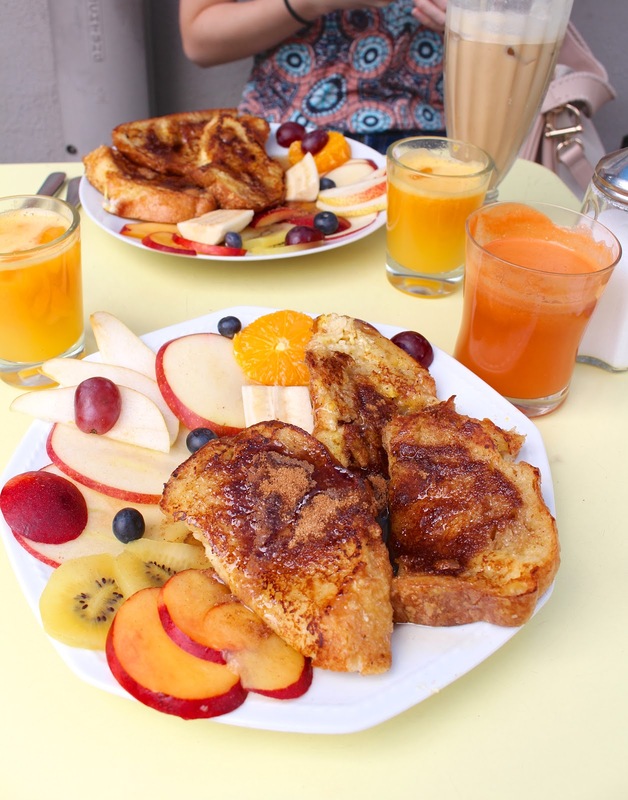 But let's talk about these wonneproppen... the most glorious plate of French toast I've ever seen! Topped with cinnamon, sugar and loads of ahornsyrup. Since I'm not that much into very sweet food, I'd definitely ask the syrup on the side next time, it was a little too sweet for my taste. But I have to give credit where credit is due, this was some seriously delicious buttery cinnamon-y French toast. The fresh fruit spread on the side just made it complete. 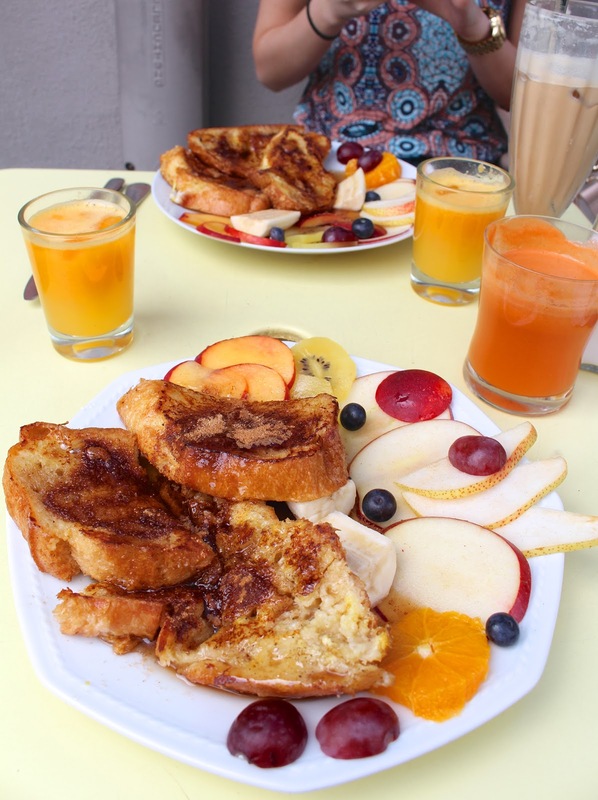 A decadent brunch, like all brunches should be! Despite our enormous plates of food, we couldn't help but wish we could stay for lunch too. I've heard good things about it, and the menu seems to be right up my alley!